See below for our range of Miscellaneous Badges. Most of the miscellaneous badges that we produce can be categorised as party badges. But there are always certain occasions or situations that can occur that require a badge that is a one-off. This could be, for example, if you want to send out a certain message to people who you would meet. Typically, in a bar you could wear badges behind the bar that said ‘Are you over 21?’. Or in a shop you could have ones that said ‘Ask me about our special offers’ . Or if you were canvassing for votes at any kind of election then you could have a badge that simply said’ Vote for Me’. We have a range of typical badges for these miscellaneous badges applications that can be simply personalised with your message. They are available in a range of background colours and font styles and colours. Of course these are not exhaustive and you can select any colour combination that you require. These are shown purely to give you some initial ideas and to get your thoughts in place. We have badges that can be supplied in 57mm or 75mm diameter, all of which have a safety pin fastener on the back. If you decide that you would prefer to use your own artwork for the badge, then this is perfectly acceptable. All you need to do is to tell us what you want to do. 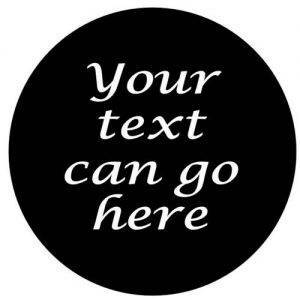 Tell us the badge size and we will send you a template that will show you the sizes that are required for the artwork. This is important as we need to ensure that the artwork not only fills the nominal size of the badge that you have chosen, but also that the artwork bleeds beyond the nominal diameter. So that when we make the badges, there will be no white edges. See our full range of badges.